It's normal to every once in a while forget a phone number, the day of the week, or what you just came in to a room to do. Memory changes, confusion, and disorientation associated with Alzheimer's, however, grow progressively worse over time. The early-stage warning signs may develop gradually and go unnoticed, or, in many cases, they're initially mistaken for the normal aging process. Since family members are often the first to notice changes that might indicate the onset of the disease they should learn the early warning signs. The earlier Alzheimer's is diagnosed the better it can be treated. While the cause of Alzheimer's disease is still uncertain, researchers agree that the risk of developing the condition increases as a person ages. The Self-Administered Gerocognitive Exam (SAGE) is designed to detect early signs of cognitive, memory or thinking impairments. Click for test form 1. Other test forms and The Ohio State University Wexner Medical Center that developed the test click here. Alzheimer's is expected to become the leading cause of death in the future, having increased more than forty-six percent between the years 2000 and 2006. Alzheimer's is the sixth leading cause of death in America, but it's still one of the least talked about diseases. It's estimated that 5.1 million Americans have Alzheimer's have Alzheimer's disease with over 650,000 under age 65. Unless a cure or significant treatment is found, it has been predicted that as many as 14 million will have the disease by 2050. To better help ourselves and/or our loved ones, all of us can benefit from knowing what the most common early-stage warning signs of Alzheimer's are. For those with Alzheimer's in their family health history you should consider insuring before being diagnosed, even having testing done can jeopardize your chances of insuring. If you or someone you love experiences any of the symptoms listed below, see your physician. A medical examination is the first and most important step if you suspect you or someone close to you might have Alzheimer's. 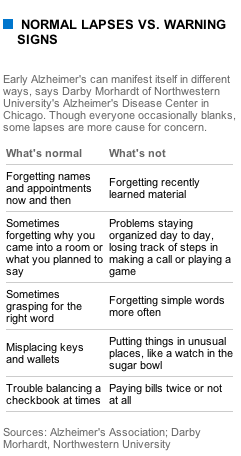 Recent memory loss that impairs the person's ability to complete routine assignments at work and/or function effectively at home : May frequently forget names, phone numbers and work tasks and have trouble remembering them even when reminded. Problems with language : May progressively forget simple words, substitute inappropriate words, and/or make statements that don't make sense. Disorientation in time and space and getting confused or lost in a familiar place : May leave their home and then forget where they intended to go, could become lost on a nearby street and not know how to get home. Difficulty completing familiar tasks : May, for example, prepare a meal but forget to serve it--or even forget that they ever made it. Distorted judgment : May dress inappropriately, completely forget what they've set out to do mid-task, or forget key routine tasks, such as keeping set appointments or caring for their pet. Problems with abstract thinking : May have trouble with simple mathematical calculations such as balancing a checkbook or remembering a familiar, often-used phone number. Misplacing things : May put things in inappropriate places, such as putting their keys in the microwave, toothbrush in the kitchen cabinet, or their briefcase in the refrigerator. Repeated and sudden changes in mood and behavior : May begin exhibiting out-of-character rapid mood swings for no apparent reason. Changes in personality : May start to act in ways that are counter to their usual personality style, for example, acting suspicious, fearful, or confused. Loss of initiative to do things : May become passive, unresponsive, express little interest in previously enjoyed activities and require real encouragement to get involved. Studies indicate that as many as one in ten cases of dementia-like symptoms may actually be caused by something less serious and more reversible, such as medication or depression. When testing for Alzheimer's, a doctor will perform a physical exam and do tests to analyze memory and reasoning skills. Individuals with Alzheimer's do not progress with the same symptoms or at the same rate. For instance, some people with Alzheimer's become paranoid and combative, while others remain placid; some like to wander; still others change their waking and sleeping hours. The federal government uses surveys to monitor nursing homes. To find survey results, use the Nursing Home Compare tool on the Medicare Web site. It's best to compare facilities within a region with one another. This gives you the best view of nursing homes in your area. Also see U.S. News & World Report Best Nursing Homes. People with Alzheimer's can live for another ten or even twenty years after the onset of their disease. Early diagnosis can make it easier for both sufferers and their families to weigh their options early on and to prepare for the changes that come as the disease progresses. Most important is learning to see the disease for what it is, changing your expectations of what someone with Alzheimer's will be like, and remembering that this can take time. Alzheimer's is an organic process and progresses over time. Early diagnosis can help individuals and their loved ones have as much time as possible to do the best they can with circumstances that are beyond their control. Working with a therapist can provide information and support for the whole family. Therapy can provide crucial insight into what to next anticipate, how best to cope day by day, and ways to move through the inevitable mix of emotions, including loss, anger, hope, intensified love, frustration, alienation, helplessness, grief, and a deepened awareness of both the power and the fragility of the human experience. The Tobinick Alzheimer Method™ is a unique, pioneering, patented** off-label treatment method for selected patients with Alzheimer's Disease who have failed to adequately respond to conventional medical treatment. Long Term Care is a family affair. The majority of caregivers are family members.